The Lodge benefits from extra-high doors, to make getting into the building easier. The eaves height has also been raised - the lowest point of the roof – resulting in an improved average ceiling height. Spacious and enjoyable to use: With a generous height of 6'2", the Lodge door opening has a generous height of 6'2" to accommodate the majority of adults, so you won't be having to duck down every time you enter. The windowed door and front window provide the log cabin with enough light, but the omission of side windows makes the building cheaper to heat. Faster and simpler: The Lodge has an overall building height of just under 2.5 metres, which gives it a better chance of avoiding any issues with current planning regulations. On the other hand, we still strongly advise that you contact your local area's council for clarification, as different council boroughs can vary. The Lodge has the benefit of customisability for several important aspects of its construction, letting you tailor the building exactly to your liking. 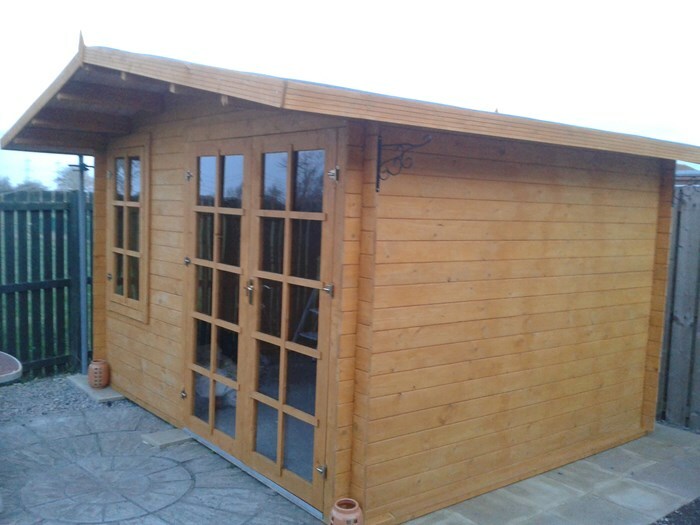 You can assemble the front in two different configurations, so you'll be able to position the doors and windows in the ideal manner for your garden layout. You'll also choose from two different building sizes and pick the thickness of your floor timber, the door and window style, glazing type and roof protection. 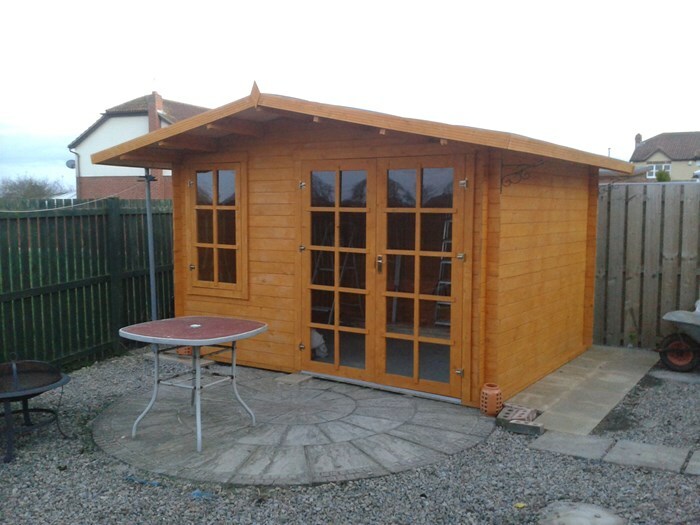 The Lodge Log Cabin can be adapted into the perfect garden building for your requirements. If you plan to use the building all-year-round, we recommend that you choose the Premium 19mm floor for the best durability, double-glazed Modern style doors and windows to insulate from the cold, and Premium roof shingles for long-lasting, reliable protection from the weather. If you're looking for a typical summer house, however, single-glazed doors and windows should be adequate, styled with the Traditional design for a classic British appearance. Then complete your building with Premium roof shingles and Premium paint, for excellent protection and personalised styling. 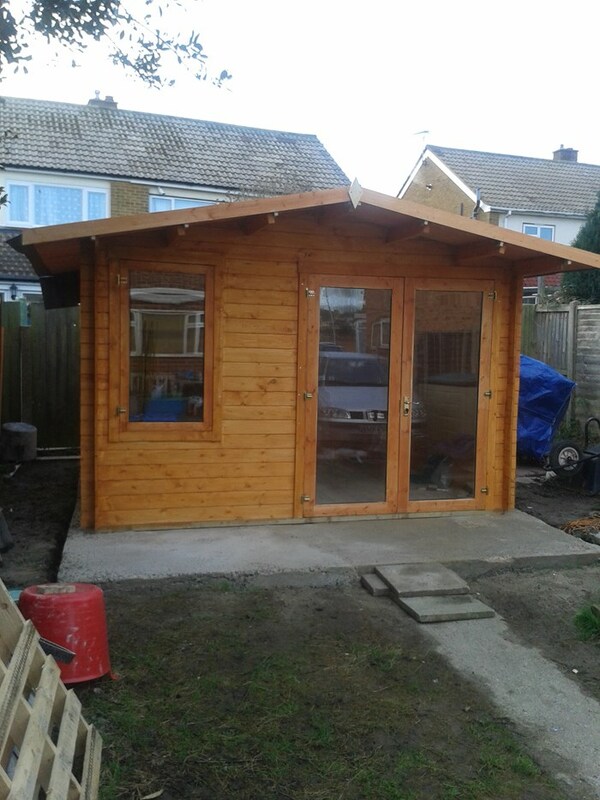 The Lodge Log Cabin is built from interlocking timbers, which is a traditional building method that gives the best possible strength to the construction. In comparison to the standard technique used for basic panel buildings, this is a superior method that fixes the timbers in place firmly, using their combined weight to create a structure that's sturdy and reliable. 19mm tongue and groove timber is used for the four walls of the building. 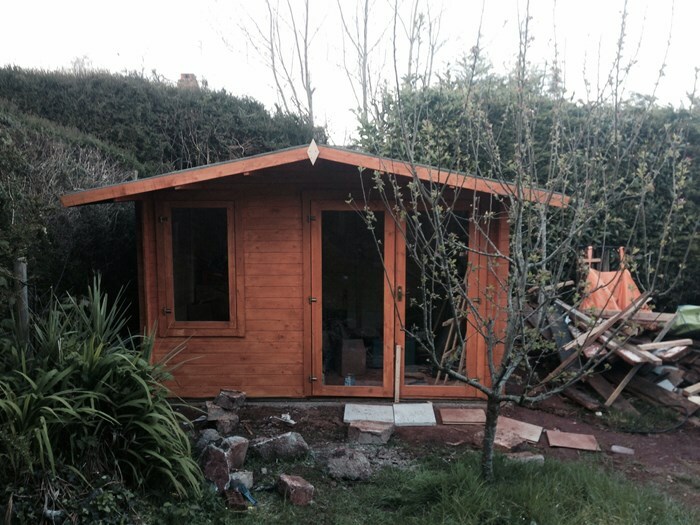 This is an entry-level log cabin cladding that makes the Lodge extremely cost-effective whilst still giving adequate insulation and durability. 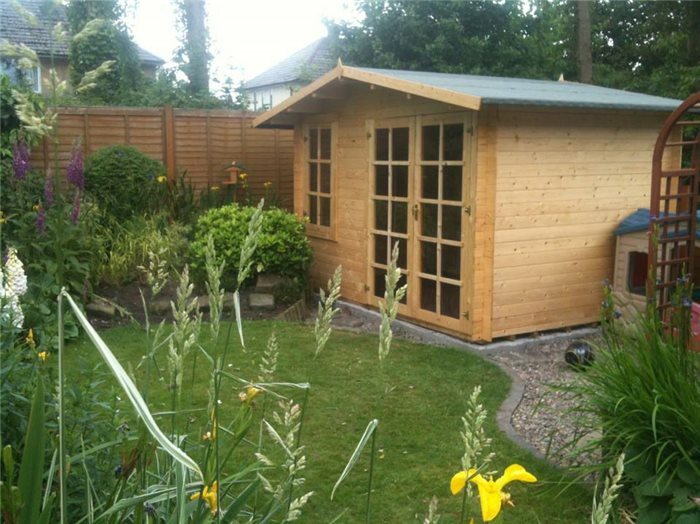 It's much thicker than the average garden shed, giving a sturdy construction so you'll enjoy the building for many years to come. The Lodge is available in a choice of two fantastic building designs, letting you pick the window styling that's perfect for your tastes. Either style has the option of single-glazing and double-glazing, so you can choose the level of insulation you need for your building. And with either style you'll also enjoy the stylish feature of the Lodge's front overhang, for an appearance that's full of character. Traditional Style (Georgian bars) – Premium and Standard options: For an appealing classic feel, the Traditional Style Lodge Log Cabin features Georgian crosses upon the doors and windows. Select Standard for single-glazed windows suitable for a summer house that you'll use during the warmer months, or Premium to upgrade to double-glazing, making sure you stay warm all through the year. Modern Style – Premium and Standard options: If you prefer buildings to have more of a contemporary design, then you'll love the Modern Style. This provides a clean and minimalistic appearance without Georgian bars. Of course, you'll also have the choice of Standard or Premium window glazing to spec your log cabin up for its intended use. If you're in need of an everyday building, such as a home office or hobby room, the heavy-duty Premium floor option is what you need. Conversely, Standard is an adequate choice for more infrequent, seasonal domestic use. Premium – heavy-duty floor: A Premium floor is the ideal choice for high-intensity needs - home gyms and offices, games and hobby rooms or summer houses with heavy furniture. This features a construction of thick 19mm tongue and groove timber, giving you insulation against cold temperatures for easier and cheaper heating, as well as fantastic durability. Standard – regular floor: For less demanding, occasional usage, we offer the Standard flooring option. This is suitable for infrequent, lighter intensity purposes like summer houses and living spaces with light furniture. The 11mm tongue and groove timber of this floor makes it a suitable economy option. Basic – your bespoke DIY floor: The basic option is for DIY experts with specific requirements, omitting any pre-built floor. The building will instead be supplied with the bearers only, for if you wish to build the base completely from scratch. Increased strength: The roof purlins for the Lodge are thick and strong, giving the roof plenty of strength and support for your peace of mind. This gives the roof the necessary strength to support substantial roof covering, meaning it's able to withstand the weight of either roofing felt or roofing shingle for added protection from the elements. Take a look at our excellent roof weather protection options below. Tongue and groove roof boards: The roof panels of the Lodge Log Cabin are constructed from quality tongue and groove timber, consistent with the rest of the building's materials. 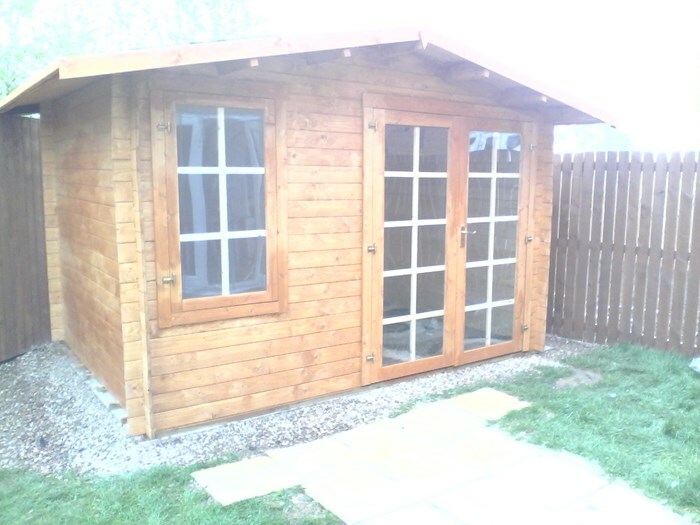 This helps improve the weather resistance and overall longevity of your log cabin, so it's built to last. Because of its position on the building, the roof is the part of the building that's most exposed and vulnerable to the weather. So it's vital that you give it good protection. Select one of our great roof weather protection options below to make your log cabin water-tight and kept in excellent condition from the day it's built. Premium weather protection: For the best weathering capability you can get, choose Premium heavy-duty shingles for your Lodge Log Cabin, available in a selection of green, red or black. These are a much thicker option than our Standard weather protection, letting the building benefit from extra durability and value, as well it being a more stylish option. Our roofing shingles are very long-lasting, with UV resistance, water-proof properties and an SAA fire rating. 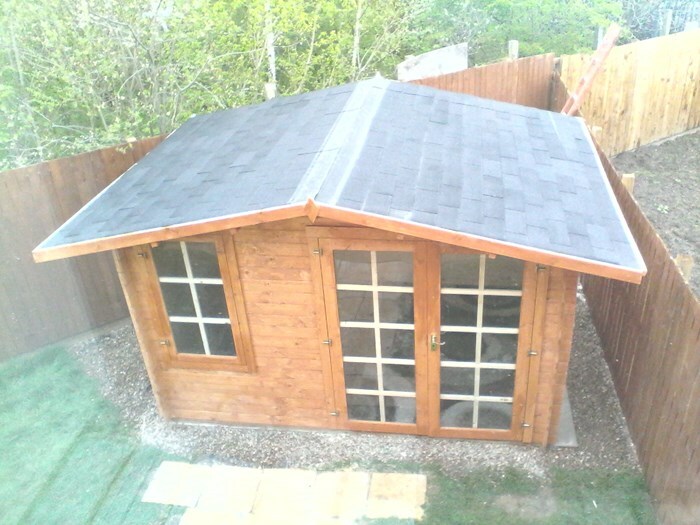 Standard weather protection: The Standard weather protection option provides you with mineral felt, the material that is used for our premium garden sheds. This is quick and easy to apply to the roof, and gives your Lodge a basic level of defence against the elements. Basic: If you intend to supply your own roofing materials, then choose the Basic option to have your building sent without. Width 409.3cm 13'5" 409.3cm 13'5"
Depth 290.8cm 9'6" 350.8cm 11'6"
Width (Internal) 323.4cm 10'7" 323.4cm 10'7"